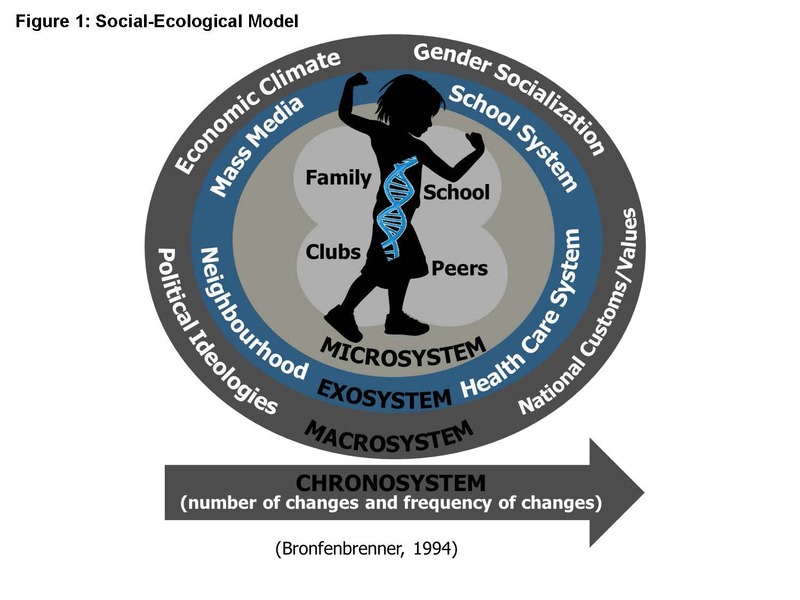 My research and clinical practice are informed by an adapted social-ecological model, which was first described in 1979 by Urie Bronfenbrenner’s “The Ecology of Human Development.” The social-ecological model (see Figure 1 to the right) argues that how we understand the health and well-being of children and adolescents should consider the nested set of systems within which children and adolescents develop. These systems include the gene, micro, exo, macro and chrono systems. The gene-system refers a child or adolescent’s biological and genetic heritability, which may play a role in their susceptibility or resilience to psychological or physiological illness. The micro-system refers a child or adolescent’s immediate and regular environments (such as their family, their school, their immediate peers and any clubs that they regularly attend). The exo-system includes distal sources of influence that are related to a child or adolescent’s micro-system (e.g., the school system, the health system, their neighbourhood, and the media). The macro-system refers to a child or adolescent’s internalization of political ideologies, gender role socialization, their economic positioning and conviction about national customs. And finally, the chrono-system considers the influence of time, such as the number of changes and the frequency of changes in the child’s environment over their development. Framed within this model, exposure to child maltreatment, the onset of mental health concerns, as well as child and adolescent resilience , can be considered a consequence of cumulative individual, family and community-level risk and protective factors that work together to shape the experience of illness and wellbeing. 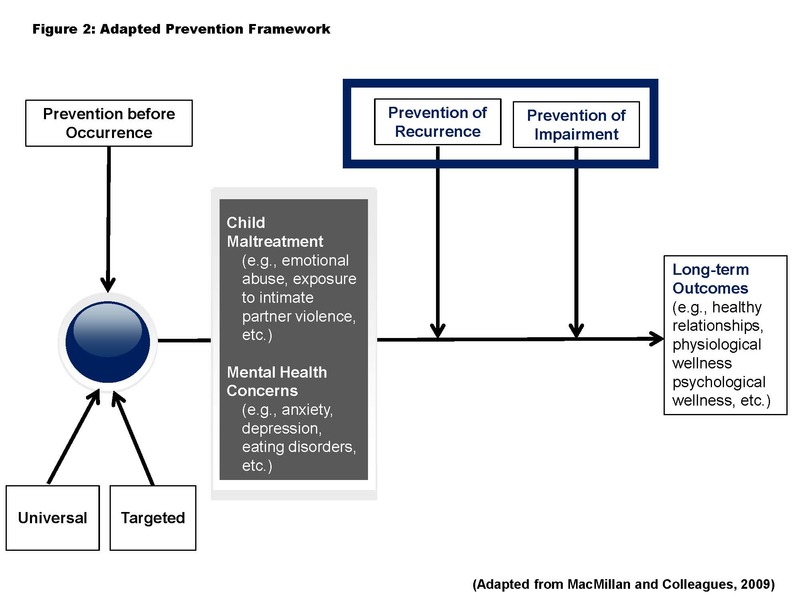 With this in mind, my research and clinical work is focused on secondary and tertiary prevention (see Figure 2 to the right – adapted from MacMillan and colleagues). I acknowledge that the prevention of all child maltreatment and mental health concerns (i.e., before they occur) is an important goal. This is also a very challenging goal that is being pursued by many thoughtful clinicians and researchers within and outside of McMaster University (see the work by Drs. Harriet MacMillan, Susan Jack, Nadine Wathen, Danielle Davidov, Tracie Afifi, Terry Bennett, Matt Sanders and Andrea Gonzalez). Importantly, we also know that the recurrence of child maltreatment, once it has happened, is high. In addition, once children and adolescents experience the onset of mental health challenges, these challenges have a high likelihood of persisting over time. For these reasons, it is equally important to: (a.) 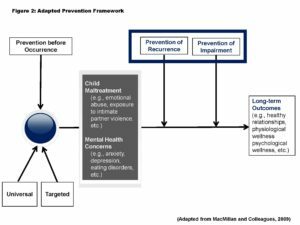 identify and evaluate interventions to prevent the recurrence/persistence of child maltreatment and mental health concerns after they have already occurred, and (b.) prevent the negative impacts of child maltreatment and mental health concerns over the short and long-term. Thus, my research and clinical work amalgamates the social-ecological lens within a prevention framework to: (1.) improve the quality of life of children and adolescents who have had these experiences; and (2.) reduce the individual, familial, and community-based consequences of child maltreatment and mental disorders, more generally.